This is the story of Mary Macarthur (1880-1921): shopworkers’ union activist and leading figure in women’s trade unionism. As the daughter of a Tory shopkeeper, Mary Macarthur could have gone the way of the young Margaret Roberts. Instead, sent by her father to spy on the Ayr branch of the Shop Assistants’ Union, she was converted to trade unionism and rapidly became branch secretary. Through Will Anderson, an activist for the Independent Labour Party and later an MP and chairman of the Labour Party, Macarthur took to socialism. With the support of Margaret Bondfield, later to be the first woman Cabinet minister, Macarthur gained the confidence to stand – successfully – for election to her union’s national executive. Moving to London in 1903, she became secretary of the Women’s Trade Union League, where she worked closely with James Keir Hardy and Ramsey Macdonald in the campaign to end sweated labour, and established The Woman Worker as a monthly magazine. She was also active in the campaign to win the vote for women, opposing moves by the main suffragette organisations to settle for a limited extension of the franchise to middle class women. 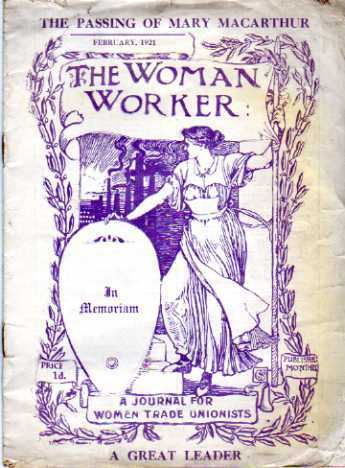 The Woman Worker: February 1921 issue marks the death of Mary Macarthur. At Macarthur’s instigation, the Women’s Trade Union League eventually became the women’s section of the TUC. During the industrial turbulence of the Edwardian era, she, however, continued to play an active role in leading and supporting strikes by women workers all across the country – among them jute workers in Dundee and chainmakers at Cradley Heath in the West Midlands. 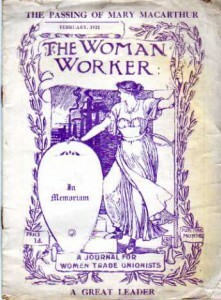 In 1906, she forged the numerous small unions set up as a result of these disputes into the National Federation of Women Workers, of which she became general secretary. Macarthur and Anderson married in 1911. An opponent of the first world war, she nonetheless became secretary of the Ministry of Labour’s central committee on women’s employment. In the 1918 general election, Macarthur stood as the Labour candidate for Stourbridge but was defeated. The following year, Anderson died in the great flu epidemic. Macarthur continued to work for the NFWW and helped bring about its merger with two other unions to form the National Union of General and Municipal Workers (today’s GMB). Increasingly ill with cancer, however, she did not live to see the outcome of her work. 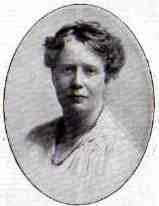 She died on 1 January, 1921 – the day the new union came into being. After Mary Macarthur’s death, a charitable trust fund was set up to provide holidays for working women who were in need through age, poverty, infirmity, disablement or social or economic circumstances. This still operates as the Mary Macarthur Holiday Trust.